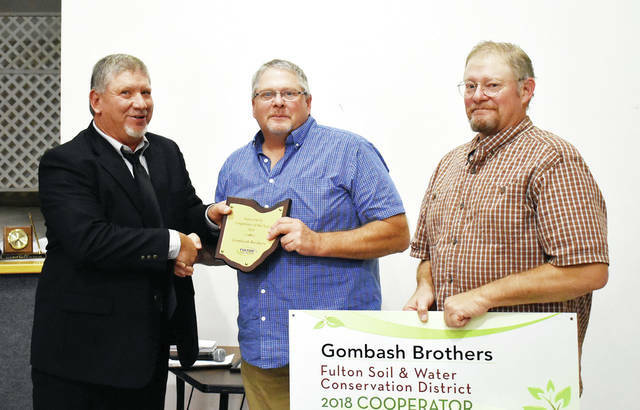 Dino and Joe Gombash were presented the Cooperator of the Year award by Bill Shininger at the Fulton Soil and Water Conservation District and the Fulton County Farm Bureau annual meeting and dinner held Sept. 11. This was the Fulton SWCD’s 70th annual meeting. Other awards presented were: Gretchen Lee, scholarship; Roberta Lay of Hesed Acres, CREP Achievement award; and Suzanne Holland, CREP Achievement award. Shininger received a certificate of dedicated service of 15 years on the SWCD board from Kim Bowles, district administrator. https://www.swantonenterprise.com/wp-content/uploads/sites/23/2018/09/web1_gombash-brothers.jpgDino and Joe Gombash were presented the Cooperator of the Year award by Bill Shininger at the Fulton Soil and Water Conservation District and the Fulton County Farm Bureau annual meeting and dinner held Sept. 11. This was the Fulton SWCD’s 70th annual meeting. Other awards presented were: Gretchen Lee, scholarship; Roberta Lay of Hesed Acres, CREP Achievement award; and Suzanne Holland, CREP Achievement award. Shininger received a certificate of dedicated service of 15 years on the SWCD board from Kim Bowles, district administrator.